Garden of Aaron: This Ain't Arizona, Y'all! Well, if this is not Arizona, then why on Earth did I plant an Arizona cypress (Cupressus arizonica)?! Even though most of my plant purchases are well-researched, I still sometimes succumb to the lure of impulse buys during a nursery visit. I knew that I needed/wanted some more evergreen trees and shrubs for a privacy screen I'm trying to establish along the edges of my property. So when the nursery employee suggested Arizona cypress 'Carolina Sapphire' as an underutilized evergreen tree that might be even tougher than the old standbys in our area (Leyland cypress, 'Green Giant' arborvitae), I grabbed an affordable 3-gallon shrub sitting nearby and headed to the cash register. Apparently that was a big mistake. 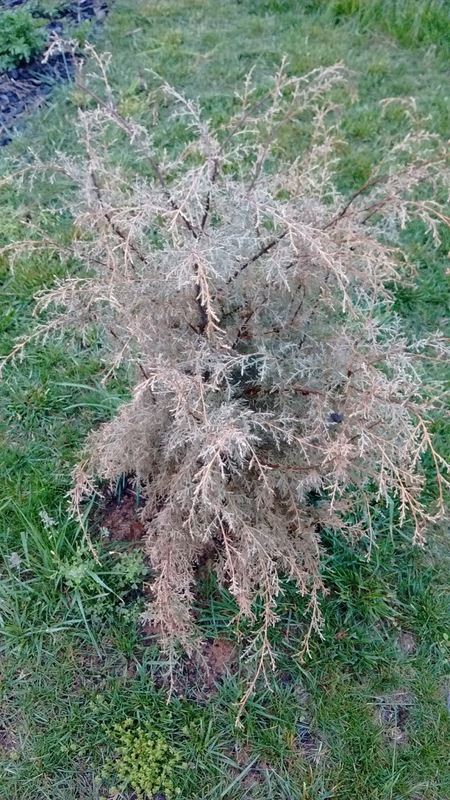 The shrub languished for a couple of weeks and then went precipitously downhill, soon turning brown, crispy and by all appearances, dead. 1) Roots/Shoots Mismatch - This was a tall plant. That's appealing when you're looking for instant impact, but I'm thinking it was grown in a sheltered, pampered life among lots of other Arizona cypress plants. Suddenly, it was out in the open on a hilltop, getting buffeted by wind storms. (We've had some doozies this year with straight-line winds around 60-70 mph.) The petite 3-gallon root system couldn't hold the tree upright in the storm, so I went out one day and found it keeled over. I'm sure that was a shock to its system. Even though I promptly propped it upright and staked it in place, it went from moping to failing after that. That's why usually it's probably a better idea to buy a plant based on the size and health of its roots rather than its top-growth. The top-growth is sexier, but I think you're much more likely in the long run to have a healthy plant if you get a shrub or tree with a substantial root system and modest top-growth rather than the other way around. 2) Two words - Wet Clay - Quoting the Arizona Tree Experts Blog - "Very hardy to many growing conditions: heavy clays, rocky and thin, sloped; they’ll grow pretty much anywhere in the Austin area. 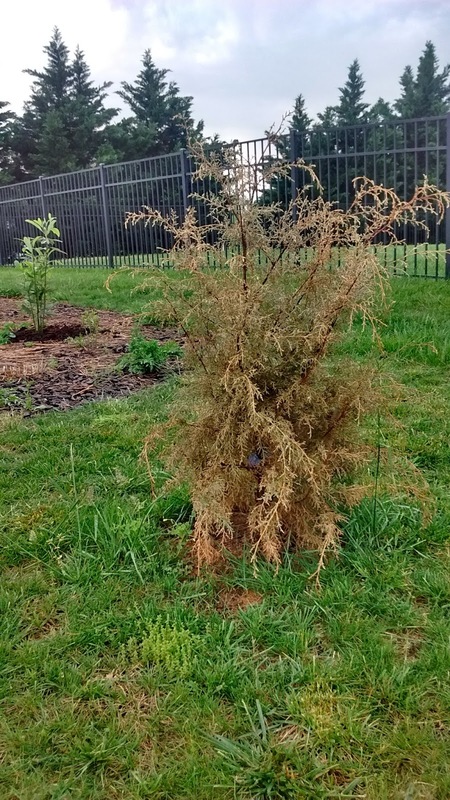 The one thing they do need is drainage so don’t confuse them with bald cypress that will grow in constantly wet conditions." Now it's true we're on a hilltop, but the Arizona cypress was planted on flat ground in the back that can stay sodden for days after a heavy rain or a lot longer than that after a series of rains. Maybe it would have fared better if I'd planted it on the slope in front of the house? Will I try Arizona cypress again? I mean, if I lived in Arizona I might try it, but not here in Tennessee. I'd much rather plant a tough, forgiving true native like eastern redcedar (Juniperus virginiana) or a regional native like yaupon holly (Ilex vomitoria). Usually, I like to champion the mantra of "Right plant, right place." In this case, I'd say my actions would be more aptly described by, "Wrong plant, wrong place." Star of Bethlehem is no Spring Beauty! Blue Mistflower - Love It or Fear It?